This is the fourth in a series of posts whose goal is to explore ways of helping learners develop their language skills autonomously. The first two posts are specific to listening. The first post, which focuses on perception of connected speech can be read here , the second post on dictations as an autonomous learning tool here and the third on “text mining” can be read here. The first two posts focus on listening, the third on autonomous use of reading and listening texts, and, in keeping with my expansion of the series focus, this post is focusing on graded readers as means of autonomous learning – language development and skill development. Graded readers are books that are written in the target language, graded to suit learners of that language rather than being geared towards native speakers of that language. They exist for a range of levels, generally corresponding to those within the Common European Framework of Languages. Graded readers often (but don’t always) contain activities related to the text, either dispersed throughout the text or gathered at the end of the book. a text, graded to a particular level. a text and an audio disc recording of the text. a text, an audio recording of the text and questions/activities that accompany the text. an e-book, with above-mentioned features integrated. probably other versions exist as well…! I recently discovered that graded readers do not only exist in English for learners of English but in other languages for learners of those languages. Including Italian! 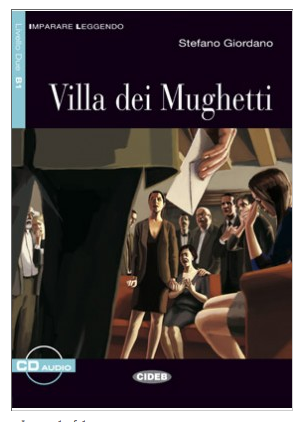 The main focus for this post will be book-plus-audio graded readers, based on my recent experience of working my way through Villa dei Mughetti, published by Black Cat. Having worked my way through a graded reader, I now feel a lot better placed to help my learners get the most out of theirs, where before I tended to leave them to it, within the remit of my reading project. In terms of choosing a graded reader, availability will be the major factor. When I bought my graded reader, in Palermo, it was the only one they had in Italian! I would recommend choosing one that comes with an audio recording, if possible, as this is a very valuable additional resource. Fortunately for me, Black Cat readers generally seem to come with accompanying cd. Locate the answer key for the accompanying activities (if you have a version with activities! ): with some, that’s as easy as checking the back of the book and finding that they are there. With Villa dei Mughetti I had to go to the Black Cat website, register as a teacher and then I was able to download them. Not the easiest, and if students are expecting the usual back-of-the-book scenario, they may be a bit perplexed and therefore a bit of help might not go amiss! Decide how to begin: Think about your goals in using the reader and the different approaches you could take (dependent on what kind of graded reader you have chosen). Decide which approach(es) you want to try. Read through the text without looking at the questions. Read the text and answer the questions/do the activities as you go along. Listen to the complete audio cd without looking at the questions or text. Listen to/read a section first, then read it/listen to it, then answer questions as you go along. Listen to a section first, then answer questions, then read it to check. Listen and read simultaneously, the whole text, without looking at any questions. A learner might use the same approach throughout or vary the approach from chapter to chapter. As mentioned above, learners’ goals will/should influence the choice of approach. For example, my dominant approach was to listen to a chapter, do the activities, read to check, then mark the score-able activities using the answer key. I.e. (5) above. My goal was to work intensively on my listening. Sound-spelling awareness/pronunciation, plus comprehension/language work. It could be useful to discuss different approaches with learners, to raise awareness of how different approaches map to different learning goals. Encourage them to experiment with different approaches and report back to their peers, so that they are encouraged to reflect on their experience of trying the various approaches – they could initially all experiment with the same approach and then compare notes, even if they were all using different graded readers (provided the graded readers all had the same resources e.g. audio and activities), and then move on to deciding which they prefer, or they could all experiment with whichever approach they wanted to and report back on whatever they have done. They could also group themselves according to what approach they wanted to try. This experimentation and discussion would fit in quite nicely with both my Experimentation with English and Reading Project approaches. As mentioned in those projects, it needn’t be very time-consuming in class. In Villa dei Mughetti, there was a chunk of activities at the end of each chapter. Each chunk included a mixture of score-able and un-score-able activities. Comprehension activities: T/F; Y/N; ordering events; matching utterances and characters etc. Language focus activities: grammar explanation plus practice activity, vocabulary activities e.g. matching pictures and words, a crossword, matching words and definitions etc. Productive skills-focused activities: each chunk of activities had both a writing activity and a speaking activity. These are straightforward and can be done as a reading exercise or a listening exercise. If learners choose to listen and answer the questions, as I did, it would be useful to encourage them to use the text as a transcript to identify why they make any mistakes. Of course this would be easier for them to do if you have done with them in class before, in your listening lessons. So, if the vocabulary isn’t useful, that’s fine, do the activities and move on. However, if is vocabulary that learners want to learn, then they need to do something with it beyond the activities in the book. For example, input it into Quizlet and use the various study and game modes; try to use it in the writing activities etc. Grammar: This (at least in Villa dei Mughetti) is generally based on language/examples from the text. If a learner is familiar with the grammar and gets all the questions in the practice activity right, great. Move on but don’t forget to look out for more examples, in context, in the ensuing text and in other texts that you encounter. However, if there are a few mistakes, it could be worth using a website or book with grammar explanations and activities, to try and clarify any misunderstanding. Once it’s under control, at least on a declarative level, it’s even more important to look out for further examples of it in context – in future chapters and other texts (written or spoken). In this way, the grammar activities become diagnostic, either confirming what you are familiar with or acting as a springboard to working on what you are less familiar with. These activities, at least in Villa dei Mughetti, are the un-score-able ones. I’m of the opinion that self-study material doesn’t have to be score-able to be useful, so I am glad these activities feature in my current preferred graded reader series! In order to get the most out of them, it is useful to have tools to use alongside them: i.e. a blog for the writing and a voice-recording tool (e.g. Audioboo, Audacity, a mobile phone, vocaroo etc, for the speaking. That way, you can collect your writing activities on your blog, and accumulate a series of voice recordings too. If using a website to record your voice, you can usually link to the recording in your blog, or if you make files on your computer, this can usually be uploaded. Evernote could be used in a similar way. This enables progress to be charted. You could also encourage learners to share blog links with each other, and compare their production. Or, if you use Edmodo with them, they could post things on it instead of creating blogs etc. Of course a class blog could be used too. Once learners have reached the end of the graded reader, they could go back through their recorded written and spoken activities, to see if they can identify progress and identify/correct any errors. Some of the activities might seem a bit lame (in my limited experience) but they may be able to be combined, with a bit of imagination. Thus, as you might have picked up on, I don’t think it’s necessary to complete the productive activities before moving on to the next chapter. As long as you are doing the activities regularly, then it just becomes a matter of how it best fits the time frame you have available. Writing a text takes longer than answering a few T/F questions, but that doesn’t mean you have to stop doing the T/F questions until you have time to do a longer activity. Dictations: A great additional use for the accompanying audio disc. Dictations may not immediately come to mind as a potential activity but actually it works well, as the language is graded to the reader’s level and it tends to be read clearly. Of course it won’t be a dictation speed or with built in pauses, but as one has control of the recording, one can repeat a short passage (a minute at most) multiple times and see how many times it takes to get everything done. If the activity is repeated at regular intervals, comparisons regarding number of times necessary can enable progress to be tracked. Comparison with the transcript, as with standard dictations, can indicate weaknesses in decoding skills. Writing/speaking: As mentioned, those in the book may not seem the most exciting, but the concept is sound. So, if a group of students are using the same graded reader, then get them to come up with alternative ideas for productive activities, that they actually want to do. You as the teacher could collect these and over time build up a collection of supplementary materials to share with future students. If your school has a library of graded readers, copies of those materials could live with the collection of readers.Students may be concerned about lack of feedback with the productive activities, so it may be useful to explain that a) it’s still a useful activity even without feedback, as it helps the development of fluency (of writing or of speaking) and b) it’s also useful to go back over the texts produced (written or spoken) and see if any mistakes can be identified, especially as time passes and language level (hopefully) consolidates. a graded reader can still be used for extensive reading/listening if the text is heard/read through first time round without using the activities. Or, after the activities have all been done, one could read/listen through the whole text without stopping for activities, enjoying a greater understanding of the text. a graded reader is a beneficial learning resource that can be used as well as more traditional texts. E.g. I read other things to read extensively and use my graded readers mainly for intensive listening. As with anything, alone it might be insufficient but as part of a varied diet of activities, including extensive reading/listening without activities, it can be very valuable. So, I don’t think it’s such an important issue to worry about. As long as students are aware of different ways of using their graded readers, of how these ways map to different learning goals, which may change as they progress through their graded reader, and, finally, of the benefits and limitations of graded readers as learning resource, then they can use their graded readers as suits their purpose and get as much out of them as possible. Graded readers are a rich resource of learning, perfect for autonomous study. This is particularly true if you have access to an audio recording as well. A wide range of approaches can be used with a graded reader, depending on learning aims. There is also potential for a students to do further activities not stipulated by the graded reader, and create supplementary materials for use with them. Both the process of creation and the use of these can be another valuable part of the process of using a graded reader. Some teacher guidance could be helpful in enabling learners to make the most of their graded reader, through a cycle of experimentation and metacognitive discussion. This could be achieved without the graded readers necessarily becoming a teacher-led/controlled activity. If you have any more ideas for helping learners use graded readers more effectively as an autonomous learning tool, please share them by commenting on this post. This entry was posted in Learner Autonomy and Metacognition and tagged activities, extensive reading, graded readers, italian, language skills, learner autonomy, listening, metacognition, Reading, Resources, skill development, vocabulary. Bookmark the permalink.